In 1997, I was a Parochial Vicar in Janesville, WI (home and parish of Speaker Paul Ryan). The Packers and Brett Favre were making everyone a Packer fan, as they had just come off a Super Bowl win from the previous season. I was a lifelong Packer fan. In fact, I took Jerry Kramer’s number 64 in high school, and went on to be make Wisconsin All-State Football honors in my senior year. Even my present email address has Jerry Kraemer’s number 64. I had every intention to become a Packer football player, until a neck injury sidelined me in my first year of college. I joke the “God broke my neck” to change my direction. While I was around for the Division Championship game and the NFC Championship game, I had scheduled a sabbatical in Rome, and so I was not around for the Super Bowl. They lost. Prior to leaving, though, I got in a deal where the Packers were offering one share of stock to any fan who wanted to purchase it. Of course I did, but it did not arrive before I left for Rome. While in Rome, on February 2, 1998, I had the experience that changed my life as a priest forever. It was the Feast of the Presentation. It was my 10th anniversary sabbatical, and I was studying in Rome for three months, at the time. All of us priests studying at North American College received a beautiful engraved invitation, and we were thrilled to be going. We were told that we should go two hours ahead of time, if we hoped for a good seat. I joked that I don’t go that early for anything, even for the pope. We arrived about 30 minutes before Mass, and they were right … there was no hope for a seat, and we were destined to stand in the back (which was about a city block away, in that huge Basilica). With five minutes to go, an usher looked over at a priest friend and me. Now realize, there were 100s of priests there. He signaled for us to come over to him. He proceeded to take us up the aisle. He kept going and going and going, until we got to the two front rows reserved for Bishops and Cardinals … the only rows with velvet kneelers. He motioned for us to sit there. To this day, I have no clue why he singled us out, amongst the 100s of priests in attendance, to sit in front with the Cardinals. There we were in St. Peter’s Basilica in Rome (see photo above), about to pray with the Vicar of Christ. As Mass began, glorious “sacred” music filled the Basilica … and my soul. Of course, being a Papal Mass, there was great attention given to precision (like a military Honor Guard), which struck me as “beautiful order” and honor due to the Majesty of God. But, it was more than that. While I had always loved the Mass, I felt, maybe for the first time, that we were truly “glorifying” God. On that day, February 2, 1998, I was truly changed. I began to ask myself, “What have I been doing?” I had spent the first ten years of my priesthood buying into the common notion that, if we create all kinds of trendy nuances to the Mass, while we kept the Mass as whimsical and entertaining as possible, people would hear about how “cool” and “fun” and “with the times” we were, and come running. Things like “Go Packers” at the end of Mass. We were treating the Mass as a commodity that we needed to somehow market to the world. Worse than anything, I realized we were all but throwing out any sense of divinity; any sense of the supernatural. Where, in all of this, was any sense of awe and wonder in God’s presence? Where was the sense of God’s glory and majesty? In that very same year, Dr. Alice von Hildebrand would clearly identify the epiphany I received that year, twenty years ago today. Now let us abolish the terms “conservative” or “liberal”, the terms “left” and “right” which are secularistic. I suggest that we say from now on “those who have kept the sense of the supernatural and those who have lost it”. That is the great divide, that is the essence. Do you look at the Church and her teaching, whether dogmatic or moral, with a supernatural eye, or do you look at it with secular lenses? That is the divide. Left and right confuses the issue. Let us re-discover the greatness and the beauty of the supernatural and I claim that it is so difficult in the polluted world in which we live, that if we don’t pray for it every single day, we are going to be infected. It is the air that you breathe, the newspaper that you read, the television show that you see, time and again you will see this is a fight and attack on the supernatural. You need fear of the Lord, which does not mean that you are afraid of God. It means that nothing to you is more important than God, that everything in your life centers around and is subordinate to your love for God. And your equipping needs to include piety. That means that you honor God above everything else, that you worship him alone. These spiritual gifts enable you to find true balance; they allow you to know what your life is about. Equipped with these gifts, you are ready for mission. Having received the fire of the Holy Spirit, you are ready to set the world on fire. As you can see, the entry point to all of the Gifts of the Holy Spirit is “Fear of the Lord” (Also called, Awe & Wonder). THAT’S what happened to me on February 2, 1998. I was given this “Gateway Gift of the Holy Spirit” that brought me into the “Upper Room” where all of the rest of the Gifts of the Holy Spirit are found. I entered the Divine Life. I came to understand that without this “trigger,” we are prone to reduce our faith/religion to merely another organization that has a sense of social responsibility. Jesus is then reduced to an historic figure to emulate. Mass is just a social gathering that many may say (without saying), “It had better have good entertainment if you are going to make me endure this for an hour.” Again, all of the supernatural is stripped out and the belief in miracles and the power of supernatural grace is mocked as the ignorance of our ancestors. So, we can see why Satan is winning. He is in the supernatural realm using supernatural weapons, while we have surrendered ours. Here’s an interesting addendum. A couple of years ago, I was getting ready to speak to a men’s group. I planned to tell the story of my conversion at the Papal Mass on the Feast of the Presentation, February 2, 1998. 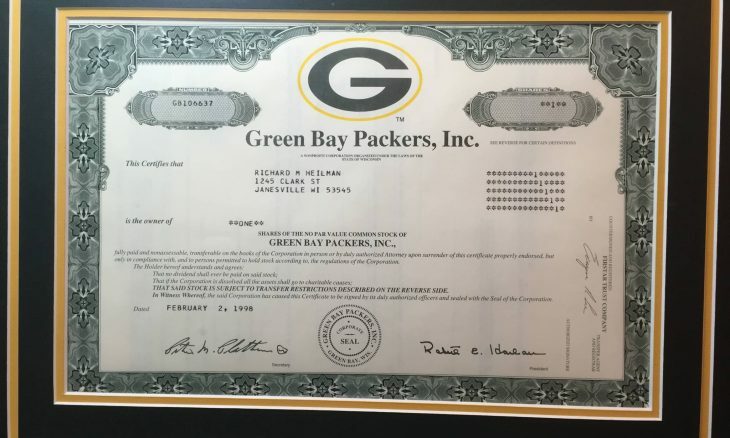 I figured they were all Green Bay Packer fans, so I thought it would be fun to show them the Packer stock certificate I received that same year. It was then that I looked closely at the date on the stock certificate. Look for yourself. It wasn’t just the same year of my conversion to the supernatural life, but …. WOW!!!! God has such an amazing sense of humor.